This section provides a quick comparison of image quality of JPEG image files with different compression quality levels 95%, 90%, and 85%. One main advantage of using JPEG image file format is that you can increase the compression rate by lower the quality level to reduce the file size. Let's compare 3 high quality levels: 95%, 90% and 85%. 1. Open GIMP-Red-Gradient-Spiral.xcf and save it as GIMP-Red-Gradient-Spiral_095.jpg in JPEG format with a 95 quality level. 2. 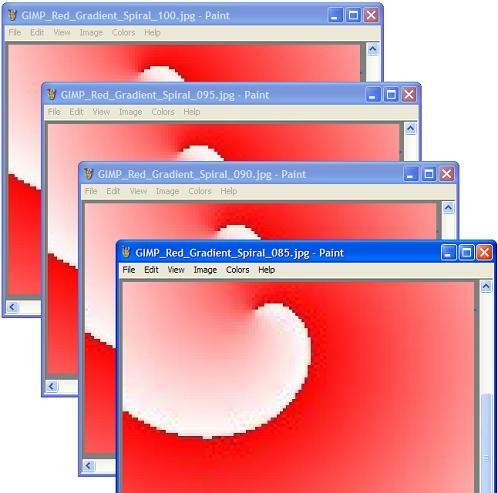 Open GIMP-Red-Gradient-Spiral.xcf and save it as GIMP-Red-Gradient-Spiral_090.jpg in JPEG format with a 90 quality level. 3. Open GIMP-Red-Gradient-Spiral.xcf and save it as GIMP-Red-Gradient-Spiral_085.jpg in JPEG format with a 85 quality level. Image saved with a JPEG quality level of 85%: The quality deterioration is very visible. 85% is actually considered as a good quality by Microsoft, because its Paint program always uses 85% as the compression quality level to save JPEG image files. Image saved with a JPEG quality level of 90%: The quality deterioration is still noticeable. As a comparison, 91% is considered as the STD (Standard) quality by Sony for my digital camera. Image saved with a JPEG quality level of 95% and 100%: The quality deterioration is not noticeable any more. My Sony digital camera uses 97% as the Fine quality level.